Today’s episode is sponsored by The Queen of Purls! The Queen of Purls is an independent yarn shop in Glasgow, run by Zoe Armstrong. Zoe sells natural wool yarns and fibres for felting and spinning. 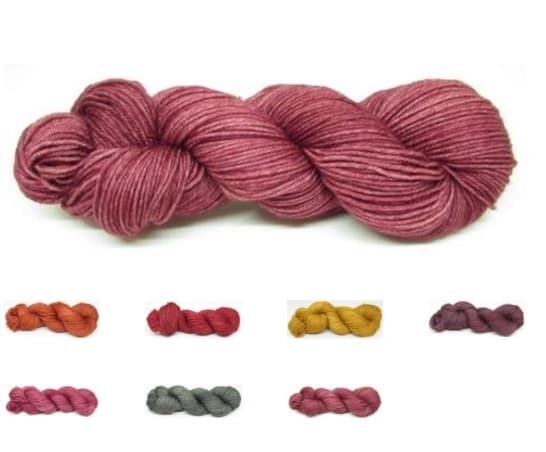 She has an awesome selection of British wool and brands, as well as dyeing her own yarn range. Listen in to hear Zoe give me a tour of her shop and find out how you can win a very special skein of her hand-dyed. Thanks so much for tuning in again and for all your wonderful feedback since the last episode. It was lovely to hear that so many of you enjoyed the interview with Maylin last time and that you are enjoying the Woolly Muckers series of chats. I was delighted with the lovely Kate Makin, from Northern Yarn, asked if I would like to try her Dorset Lambswool and I thought this would be a good opportunity to let some of our Woolly Muckers also get their hands on it. I was a bit cruel though, I didn’t tell them what it was! 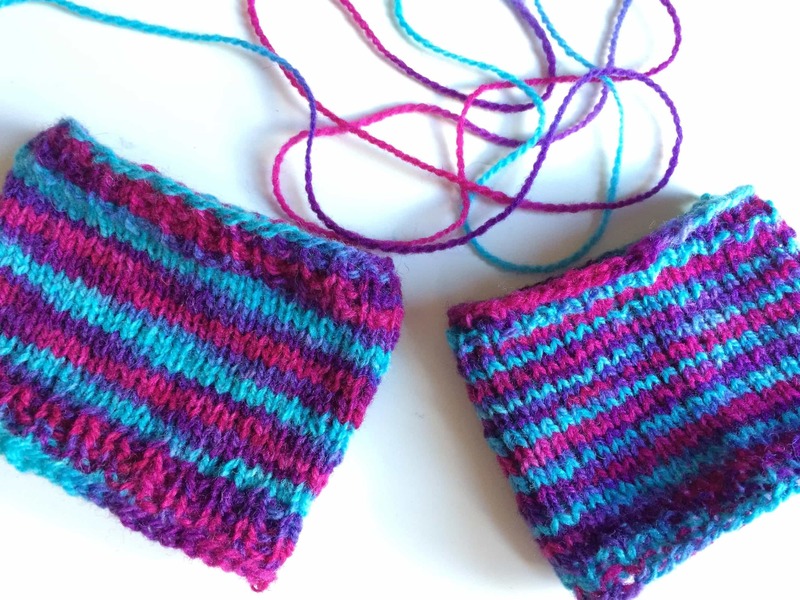 I sent some little untagged skeins to Maylin Scott, Susan Hobkirk (who will be our mucker next month) and Alison Mayne and asked them to give Kate’s yarn a swatch. I also swatched too. Kate was inspired to start Northern Yarn when her LYS closed down in 2015. wanting to source great local wool with a sense of place, the business took off from there. In addition to sourcing wool from small producers, like Dodgson Wood and Crookabeck Herdwicks, Kate commissions her own British breed yarn and blends. The 4ply Dorset Lambswool, which comes from pedigree flocks in Lancaster and it is a really lovely breed yarn. This is what our reviewers had to say, remember they did not know what the brand or fibre content was, just the weight. I sent them some natural coloured yarn, whilst I worked my swatches in the same wool but a dyed skein, by Angela Gardener. 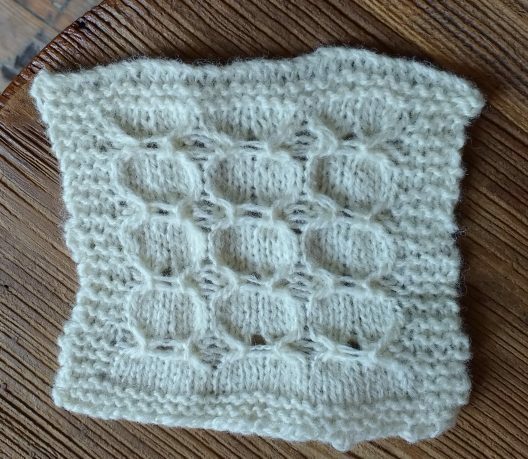 Alison wrote: This 4ply was a crisp texture to work with initially, but softened in the hands and bloomed beautifully after blocking. I thought the feel of the fabric might match more traditional knitting such as colour-work or something more structured, so I noodled about in the swatch with some easy lace and ribbing. It has held these textures well and I think it would suit hard-working / heritage / colourwork garments especially. Super warm fibres, so bunnets of all types would also be great in this yarn. Susan wrote: When I first handled it I thought it was quite crisp and crunchy. I reckon it’s a 4 ply Shetland, very like J&S or similar. Knitted it on 3.25mm needles and got a tension of 25 st x 32 rows to 10cm square. After blocking, it barely changed in size although I could easily have blocked it more aggressively and made it a bit bigger. Before washing and blocking I thought it was still a bit on the “scratchy” side (ahem! We don’t use that word here at KB, Susan. The Ed) but afterwards it was deliciously soft and just generally lovely! I wore it on my shoulder, under my bra strap and it had no itch/scratch whatsoever. I could easily have worn it next to bare arms. Not even a hint of prickle. I also found it quite a “sticky” yarn and so would be perfect for steeking. I’m sure it wouldn’t unravel. Maylin wrote: Initial squish: soft crispiness with just the slightest of halos. Also a really lovely, creamy white with just the odd stray black fibre. I cast on with 4mm needles and knit a swatch of the medallion cable stitch then washed and blocked. It has decent stitch definition and the garter is crisp. After wearing it next to my skin for 8 hours, the surprise was the lack of any prick factor; I truly never noticed it was there. It does keep its wrinkles though, so it did need a bit of pulling and smoothing out to make it all straight again. Knitted up, it has developed a slightly felted look, not unpleasant, but I think it would give garments that look of a well worn and loved, comfy item of clothing. I have put it through a vigorous rubbing and crumpling test and it shows no sign of pilling at all which is fabulous. I think this would be a lovely yarn to use for jumpers, mittens and hats, shawls and socks. A very good neutral to have in the stash. Best suited to: most items thanks to its warmth and being longwearing. Great stitch definition, will block very well. Imagining Antarktis by Janina Kallio. Thanks to Kate for sending me yarn to review and thanks so much to those willing muckers for reviewing the yarn. We shall have more of this blind review fun again! If you’ve visited Scotland and you’ve been to Glasgow you may have visited The Queen of Purls. 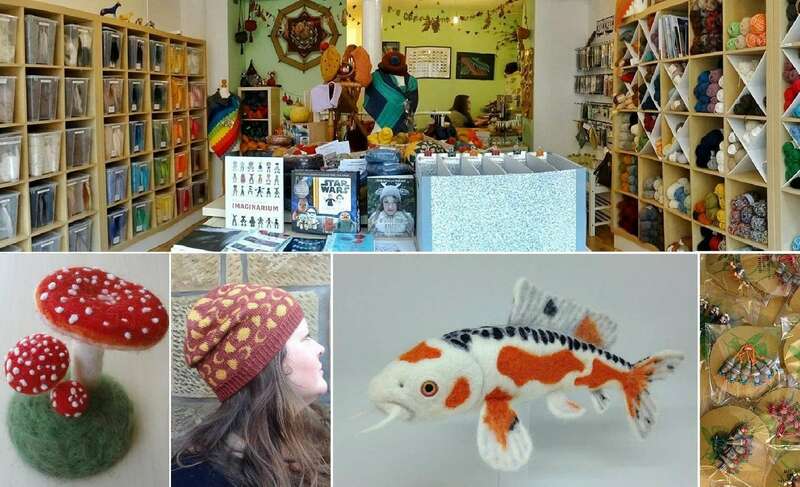 I’ve visited quite a few time (I wrote about that here and spoke about my first visit here) but I’ve never been with my mic in hand and, as Zoe is the sponsor of this episode, I thought it was a great chance to let you learn more about Zoe, the shop and her yarnie goodies! You join Zoe and I as we started talking about how we thought we were *just about* over Edinburgh Yarn Festival ( a mere 8 weeks prior to recording!) and Zoe told me that she was at the first EYF in 2013, vending as Fibre Forager and selling hand-dyed yarn. That sounded like a good place to chat to Zoe about her background and how the Queen of Purls evolved from there. Zoe also took us on a tour of her shop and gave us a run down of the yarns she stocks. Knowing where the wool has come from, the ethics and clear info around the yarn is really important to Zoe; she told me of the WoolyKnit range (including BFL, Tweed and Marl ranges) that the merino used comes from a family run farm in Spain, from non-mulesed sheep. In addition to WoolyKnit, there is an awesome range of Jamieson of Shetland, Ardalanish, WYS, Wendy Yarns, Opal and Tuku Wool. Zoe has a beautiful wall of fibre containers with many British breeds and some fantastic fibres, like camel and flax (or old man’s moustache as I called it, but don’t let that put you off!) Zoe also has her own range of hand-dyed yarns on BFL and also non-mulesed merino bases. She is going to be adding more weights to this soon. If you are going to be heading to Yarningham in July (15-16), you will be able to see, squish and buy these gorgeous yarns for yourself. I just love these earthy tones that Zoe has dyed. and that squooshy BFL base is so bouncy! Thanks so much to Zoe for letting me waggle a mic in her lovely face and for giving us a tour of the shop. The Queen of Purls is at 91 Saltmarket, Glasgow and do check out the website too for those lovely yarns and those upcoming workshops! Zoe is so bloomin lovely that she has given us a skein of her incredible hand-dyed yarn! 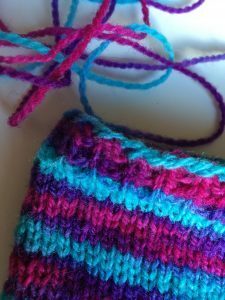 She created a birthday colourway to celebrate the 3rd anniversary of the shop and has kept one for YOU! You can enter to win this over at the KB ravelry group. Thank you so much Zoe! In July I will be bringing you my trip to Uist Wool (there could even be two episodes!) If you are going to Woolfest, do ensure you go and visit them at stand D89-90! Next month we will also meet our Woolly Mucker, Susan Hobkirk. Also we seem to be hurtling towards 100 episodes (January 2018!) what should be do to celebrate (within the realms of possibility!)? Catch you after my holibags! Happy Knitting! Music: Carefree by Kevin McLeod and Singin’ in The Rain (demo) by David Mumford – Both are on FreeMusicArchive and are both shared under Creative Commons Attribution license. Images are copyright to those attributed in the caption or in the accompanying information. Other images are mine. Kate gave me the Poll Dorset Lambswool for free in exchange for an honest review. All items reviewed on KnitBritish, whether donated or purchased, are treated in this manner. Louise, been enjoying your writing and podcasts for quite a while now, but have been so focused on my Vanishing Scotland Archive work that I have not found time to contact you. I really applaud your letter to SIC, and hope they reconsider their thoughtless & damaging decisions. I think we share our Alma Mater? SSS? I have a Facebook page but cannot hold a candle to you for diligent writing! 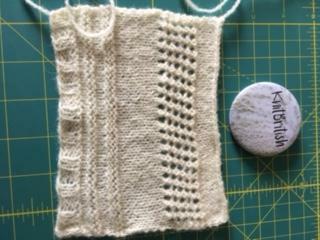 My Hebridean project taking shape will keep in touch! I’m looking forward to listening to this one! And for the 100th anniversary – how about a short retreat, or a knitters’ party. With you recording interviews, chats, knitting, etc, and live tweeting/blogging? Ah yes, but sounds expensive! I also need to think of something I can plan in addition to full time work – hence “realms of possibility” – noted though! OMG! i see Lycka & Waterlilly didn’t save in the last draft of my notes! sorry, they were there, i see it’s just the shawl linked. Another lovely episode . Zoe is so inspiring and so nice to listen to someone making their dreams come true. I know first hand what she means about Canadian yarn shops and I got a little homesick for Kensington Market and Lettuce Knits (now under different owners and called Yarns Untangled but still a lovely indie yarn shop). Next Postepisode 87 – where there were 300 sheep!